One cannot afford an error when buying a online term plan. That’s because by the time one realizes it was wrong, she/he is already dead and gone and it is the nominee who would go through the pain of getting the claim amount. While most insurance companies will settle without any issues, some others may take a while or have reasons for rejection which one may not have considered significant at the time of buying the online term plan. And it is not worth making that mistake, right? So here is the process we recommend when buying an online term plan in India. 1. Your Needs This is the first point to consider and unfortunately this is exactly what every online term plan buyer does NOT do!!! They jump straight into the product based on what their friend or colleague bought, not realizing that what is right for others may not be right for them. Don’t make that mistake else you will turn out to be under-protected or overprotected, and sometimes you could land up with a term plan that may not be ideal for your family. So whether you are securing your income through an online term plan, or covering a large home loan, or trying to do both, you need to be clear about what it is your exact need and then choose the online term plan type, amount and period to suit that need precisely. 2. Get your Basics Right Hey, do you know that you do not need a term insurance plan to cover your beyond Retirement? Why? Because your income and liabilities (not expenses) stop at Retirement and you need protection only if something were to happen to you BEFORE you retire, not after. How much of cover do you need? About 10-15 times your income, plus your loans and liabilities. Not more, not less certainly. 3. Compare Premiums You can easily compare term insurance plans and there are a whole lot of them available in the market – almost about 50 online term plan options to choose from. There are different types of term insurance plans so you need to make sure you compare the right types. 5. Check Claims Settlement Ratio Very important to consider when you purchase an online term plan. Choose a company with at least 80% claim settlement ratio. 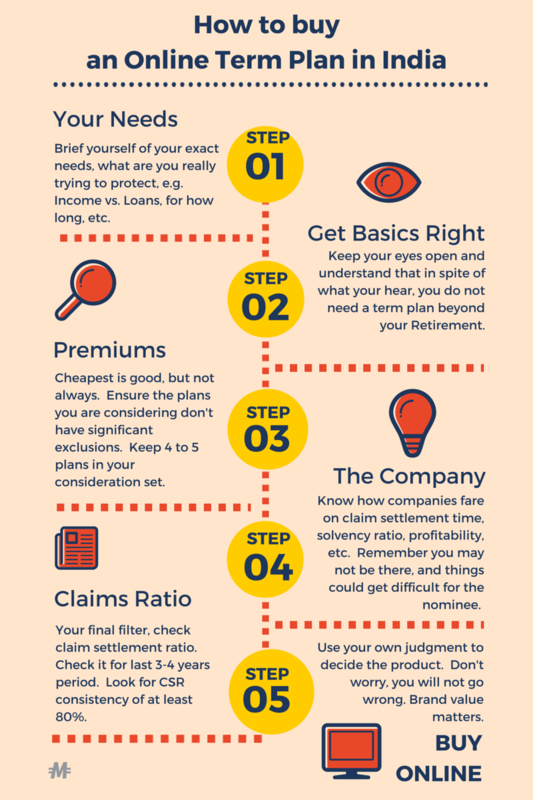 We have some great articles on claim settlement ratio and we strongly recommend you read them. And finally… BUY ONLINE So easy, so cheap, so convenient and it cuts out the agent who could leave your application form incomplete or put in a wrong fact/detail – that would be suicidal! Here’s where you can compare and buy term insurance plans. Good luck with your online term plan purchase and let us know if you need help.